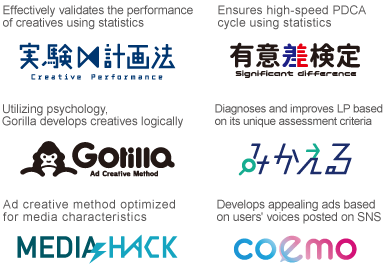 With our cutting-edge solutions that leverage the latest ad technology and our 6 ads operational bases in Japan, transcosmos offers global support for businesses’ marketing activities that have become ever more complex, with a myriad of different devices and media in addition to evolving ads technology. With optimum promotional methods that make the most of Facebook, Twitter, and LINE, solve challenges that clients’ face. Our team of experts in social media operations and advertising assist clients with their social promotions based on data obtained from analysis. Boost ad performance by using varieties of ad tools that include ad operations tools offered by Social Gear Inc., a certified Facebook partner, and “Sprinklr,” an integrated social management platform. SEM (listing ads) & SEO (Search Engine Optimization) specialists develop and execute strategies by making the most of cutting-edge ad technologies on major media such as Google, Yahoo!, and Amazon. Propose the best solutions for challenges clients face such as increasing installs and expanding sales. transcosmos helps clients maximize their profits by offering integrated apps marketing support that includes ad planning and operations, and user analysis with the use of DMP. By analyzing data, transcosmos solves marketing-related challenges that businesses face. Our dedicated team that has expertise in Google Analytics and other analytic tools sets KPIs, supports implementation and develops analysis report. The team helps clients smoothly operate their marketing PDCA cycle. Focusing on video ads, DSP and infeed ads, transcosmos develops customer touchpoint-oriented media strategies across all devices. We optimize ad delivery and targeting by programmatic media buying, and boost ad performance. Maximize ad performance by conducting personalized marketing for each individual customer based on customer and product data automatically. Primarily focusing on Google Shopping Ads and Facebook dynamic ads that work in sync with product and inventory information, the service helps clients solve the challenges they face. transcosmos’s experts with an extensive record in creating content for diverse industries develop creative content. By developing and verifying creative content based on statistics and psychology, our proprietary method helps clients improve their ad performances rapidly.